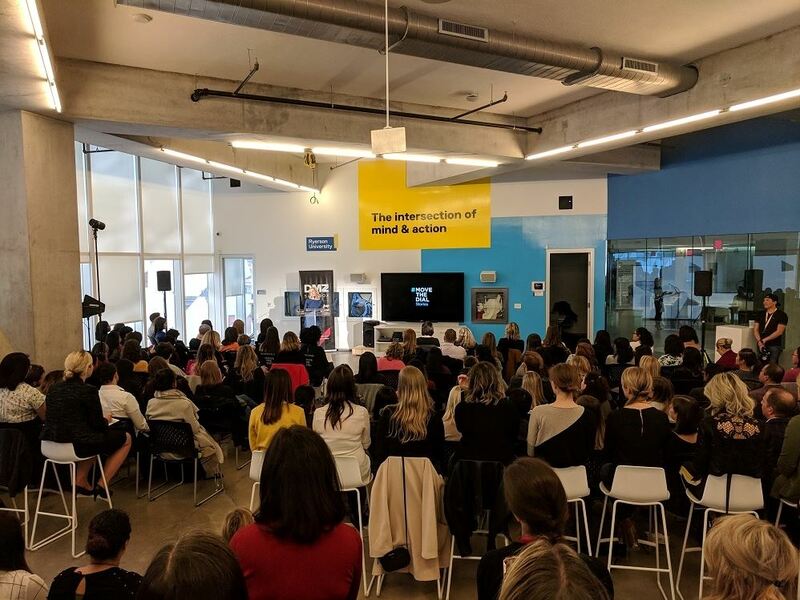 #movethedial tackled the issue of imposter syndrome in entrepreneurship during their Stories Toronto event on March 20th. Speakers shared the different ways imposter syndrome hit them and how they overcame it, offering inspiration and practical tips for people to challenge their own self-doubt and self-sabotaging behavior. We have to quiet the voice questioning ourselves, judging ourselves, and judging others, said #movethedial founder Jodi Kovitz during opening remarks. Kovitz went on to share her encounters with imposter syndrome. Self-doubt popped up every time she made a bold move in her career, like leaving a cushy legal job for the tech world, becoming a tech CEO, and eventually founding #movethedial. Chioma Ifeanyi-Okoro, the emcee for the evening and founder of My African Corner, an accelerator for Black-owned startups, echoed that imposter syndrome comes during big moves. She added that when you take bold moves, you not only face imposter syndrome, but “also its cousin, self-sabotage.” She then reminded entrepreneurs that taking action against your passion and best interest is just another form of imposter syndrome. You need to ask ‘How can I work towards the person I want to be?’ said Ifeanyi-Okoro. Don’t compare your day 1 to somebody else’s day 6,000. Saying entrepreneurs shouldn’t compare themselves with others has some tensions in the community. Some say it’s damaging while others say it’s a form of healthy competition. Ifeanyi-Okoro is in the former camp and highlighted how comparing yourself to someone else’s journey not only discredits the obstacles you’ve overcome to get where you are but also takes energy away from looking at where you want to go. Someone else may have a little more than you in a particular moment but if you focus too much on what they have and do, you’ll miss out on what you want to become. Leen Li, CFO of Wealthsimple, felt imposter syndrome even as she prepared to speak at the event. I thought ‘what did I do to myself?’ Li said. Look at how accomplished the other speakers are. I must prepare myself. Li practiced, re-wrote, and re-practiced her story multiple times, each time thinking she had more to do. Later her colleague reminded her this was the first sign of imposter syndrome: the obsession with over-preparedness. Their reminder made Li think back to three lessons her mom taught at an early age: don’t compare yourself to others, nobody’s meant to be perfect, and don’t compete with others but instead take your own path. Li shared her mother’s lessons with the crowd, recounting the childhood experiences that led her to learn them. Then she shared the conclusion she came to in regards to speaking at the event: she may not have the best presentation skills and may speak with an accent (she emigrated from China) but she brings a lot of other things to the table that are valuable on the whole. It’s about working as a team to achieve the best business results, Li said. We’re all born to be unique, imperfect and authentic self. Similar to Li, Raquel Urtasun, the head of Uber’s ATG program and a professor at the University of Toronto, frequently wondered if she was good enough in her career. Coming from a small town in northern Spain, Urtasun rose to become one of the world’s most prominent researchers on artificial intelligence. But even that wasn’t always enough. I always had this thought that I don’t belong, Urtasun said. What helps was focusing on what I’ve done – and how I can become better. Every day of life is a learning experience. What matters is where you are in your journey to become the best version of yourself and to never give up, no matter how bad the situation is. Continuing to take action in the face of bad things is a lesson Alwar Pillai of Fable Tech Labs, an accessibility testing platform for websites, learned the hard way. During a pitch competition, Pillai was given harsh feedback that she took in as much as she could. She worked hard on her pitch, continually improving. Then she got two phone calls. One was to say she made it into the competition finals. The other was to say her father was very sick, halfway around the world in her native India. Stressing between family and business, her mother told her to wait until tests came back before booking a ticket home. She stayed in the competition, but by her own accord “fumbled” through the pitch and didn’t answer any questions right from the judges. When I sat back down, I thought about all the things I did wrong, she said. And then she won. Her imposter syndrome ended up having no bearing on her, just as it ultimately didn’t stop Kovitz, Li, or Urtasun. It was such a big moment from everything – failing, getting feedback, getting criticism, and fighting every time, she said. That moment gave me the confidence to say I can do this. The other speakers at the event felt similarly, each one creating the kind of world they want to live in, bit by bit. For Urtasun it was about making a home in Toronto and connecting private industry to academia. For Li it was about bringing her unique value to the table in the best way she can. And for #movethedial as a whole it’s about ensuring these stories get told as often as possible, encouraging people to go out of their own way to help someone else. As Ifeanyi-Okoro said in both her opening and closing remarks, “it’s about sending the elevator back down” so others can rise.